In our earlier article we saw the >Basic of Mint MT language and the basic syntax for declaration and use of Variables , constants in Mint MT programming language. In this post we will see about the arrays and scope of variables and also some basic functions for simplifying the motion tasks. Let us first understand what are arrays ? An array refers to a series of variables referenced by a single name, using an INDEX to tell them apart.Arrays are initialized at compile time so can be placed anywhere within the program. Also On program download array contents are initialized to zero . Array contents are retained in fixed programs on controllers with battery-backup (NMBX), even after powering the controller. Values are not retained after power off on Nextmove PCI or Mintdrive II (unless specifically saved to NVRAM).No NVRAM on Flex+Drive II so arrays are always non-retentive. With the above line , the fifth element of myarray will be assigned value 100. Similarly it can be done for any element of any array. 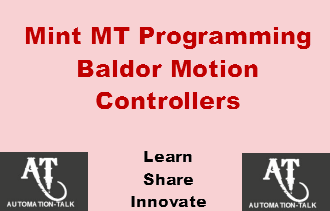 As Mint Language is specially for Motion Control , so for high end applications where we need Machine Recipe we have the option to define Multi-Dimensional array. We will continue this Mint Programming tutorial series , so dont forget to subscribe to get all Mint Programming Tutorials in yours Inbox.Subscribe to Automation-Talk by Email.